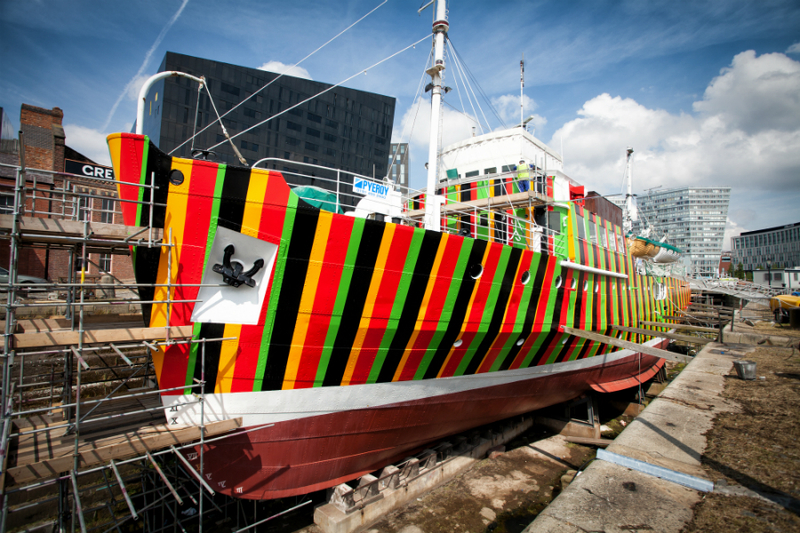 Venezuelan kinetic and op-artist Carlos Cruz-Diez, well-known for his wild, immersive experimentations with colour, unveils his latest work, Dazzle Ship, this week. 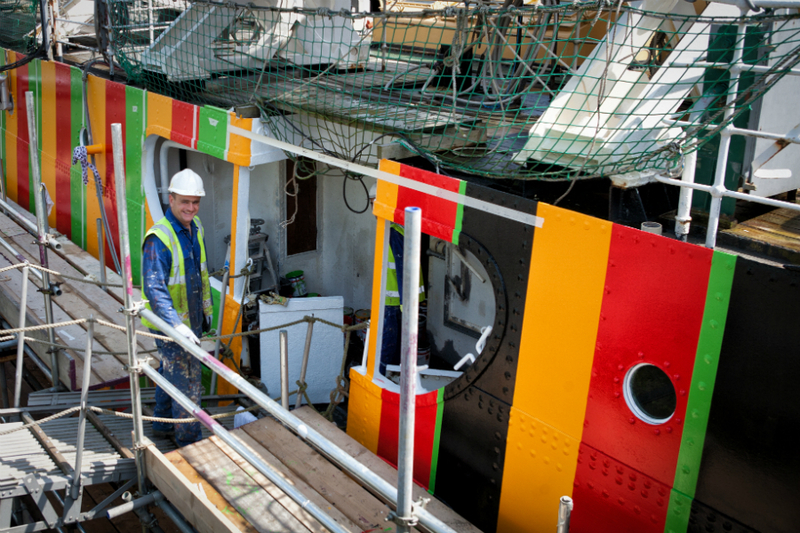 Aiming to reinterpret ‘dazzle’ camouflage — a complex arrangement of geometric patterns painted onto vessels as a way confuse the enemy during World War I and II – Cruz-Diez’s work has transformed the Edmund Gardner, a former pilot cutter in dry dock opposite the Maritime Museum. 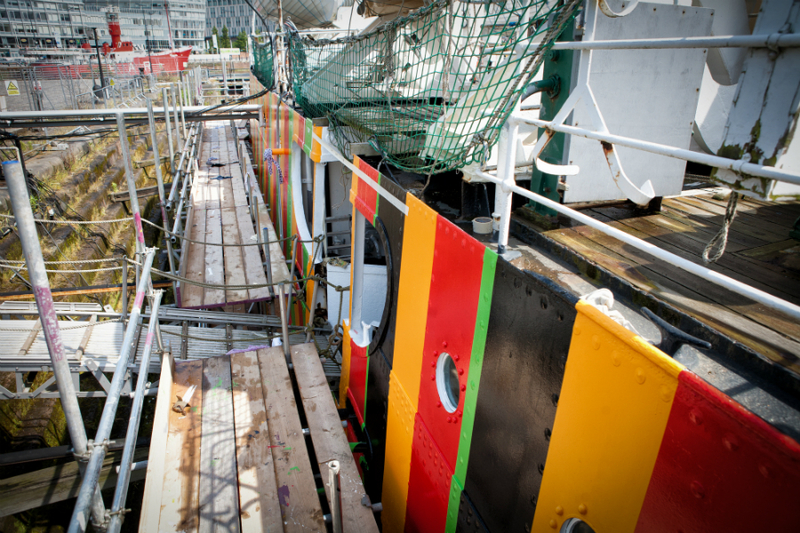 Turning Liverpool “into a sci-fi sculpture park” by commissioners Liverpool Biennial, Tate Liverpool and 14-18 NOW — and in partnership with the ship’s owners and conservators National Museums Liverpool — the Dazzle Ship is part of Monuments from the Future: a new initiative inviting artists and architects to bring large-scale imaginary monuments from the future into the present. 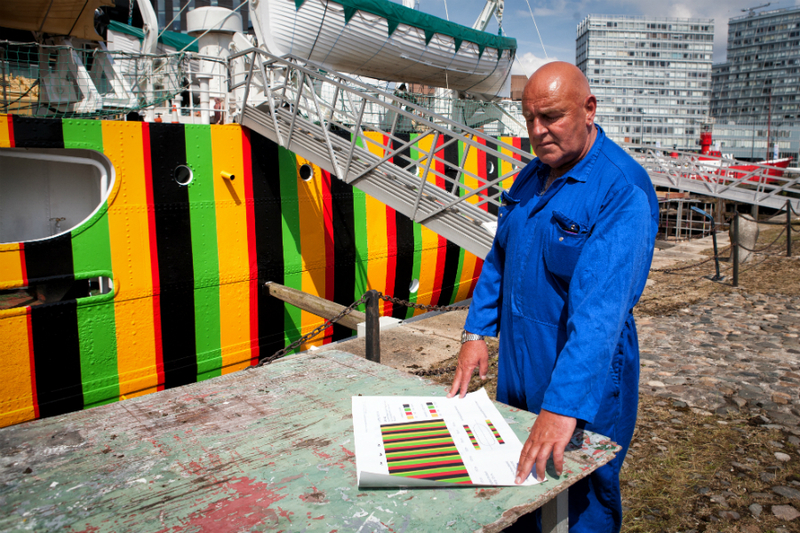 The job of translating Carlos Cruz-Diez’s plan has been undertaken by historic ship building company Cammell Laird, who produced over 200 vessels during WWII alone. Their task has been a very precise one; the pattern has to be measured out by hand, steadily building colours and black stripes at regular and shifting points, resulting in a kinetic, ‘moving’ image. 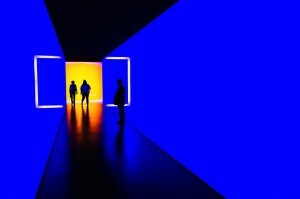 We climbed aboard to speak to some of the people involved in bringing Cruz-Diez’s artwork to life. 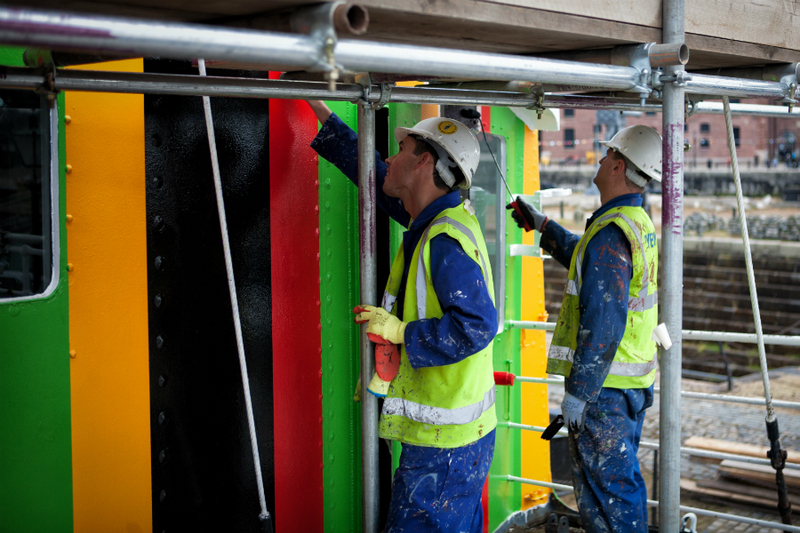 Above: men from Cammell Laird painstakingly measure and tape out the designs from Cruz-Diez. Dazzle painting was invented by artist Norman Wilkinson; each pattern was unique, and many of the designs were created by women from the Royal Academy of Arts (London). These sample patterns were then tested on wooden models, and viewed through a periscope in a studio to assess how they would work at sea. The dazzle technique was introduced in 1917, as German submarines were threatening to cut off Britain’s supplies. 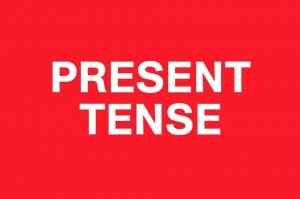 The idea was not to hide or disguise, but to paint the vessels in a way that would optically distort them, making it difficult for submarines to calculate the course the ship was travelling on, and so know from what angle to attack. Borrowing heavily from Cubism, the ‘dazzle’ was achieved by painting the ship in contrasting stripes, shapes and curves. “It’s been a change — I’ve never painted anything like this before. They did this during the war; I’ve seen the pictures, but only in black and white. 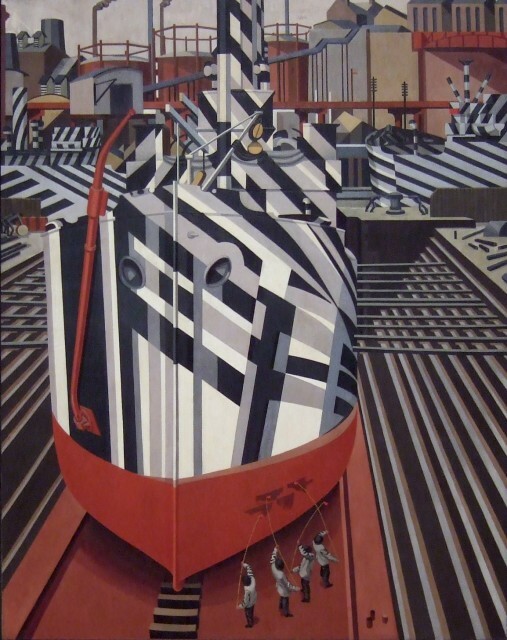 Above: Edward Wadsworth, Dazzle-ships in Drydock at Liverpool (1919. 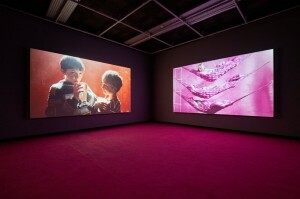 National Gallery of Canada). 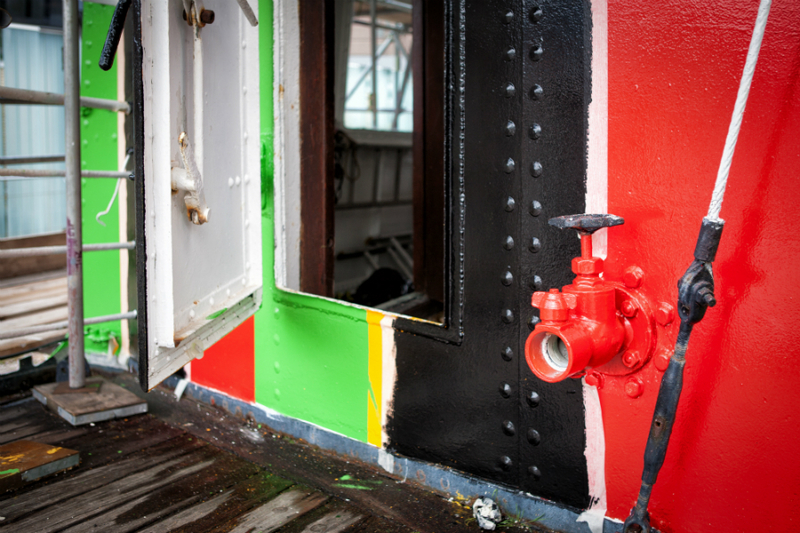 The artist supervised the application of dazzle patterning on over 2,000 ships, and utilised nautical themes in his art for the rest of his career. “We are absolutely thrilled with the new-look Edmund Gardner. 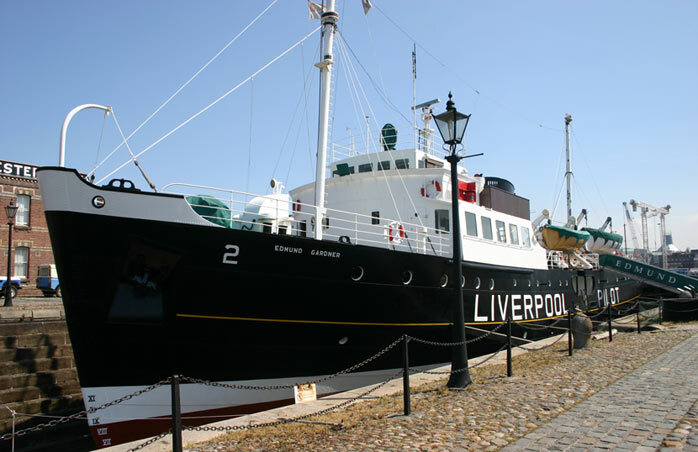 It’s fantastic that this much-loved ship is very much centre of attention and can play a key role in the Biennial and First World War commemorations. We hope she attracts many thousands of visitors over the coming months. 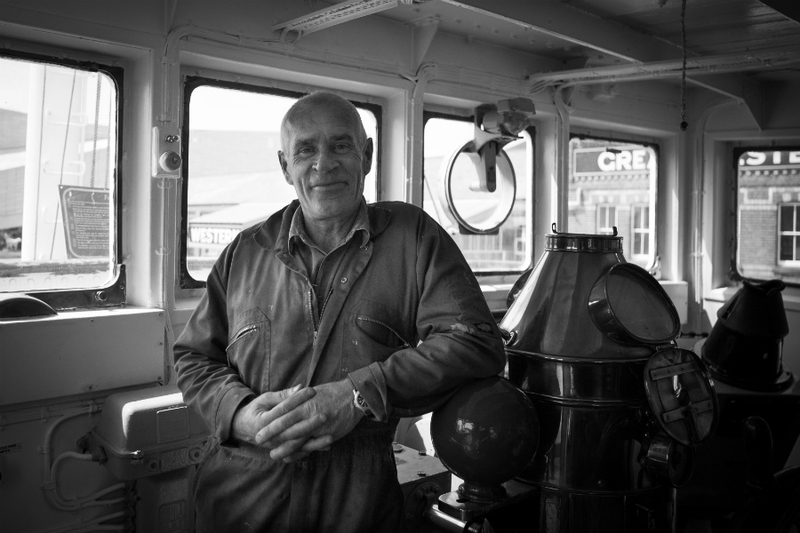 “I’ve worked here about 29 years, both on this ship and the De Wadden. It’s been a good job. It’s lovely to get a coat of paint. I like it. It’s a big ask though — you’ve got to get take the weather into account. 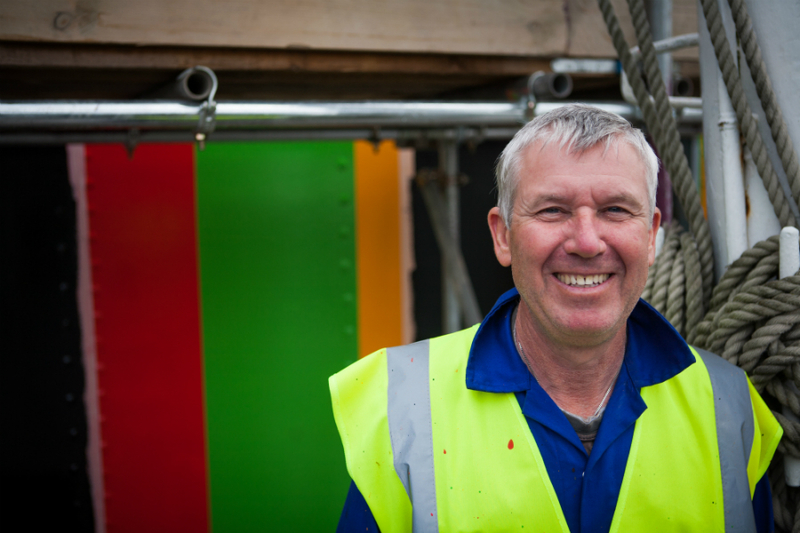 “We had to put two coats of white paint on before we started… midship, painting at 50cm with yellow, green, red, then the black starts off and we keep losing 5cm at a time, so the result ‘be-dazzles’ you.